DD Form 2285 - also known as the "Invitational Travel Order (ito) For International Military Student (ims)" - is a Military form issued and used by the United States Department of Defense. The form - often incorrectly referred to as the DA form 2285 - was last revised on July 1, 1995. 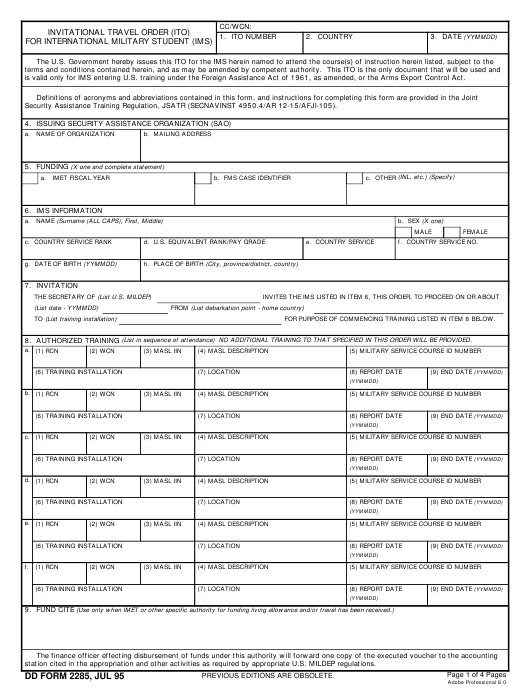 Download an up-to-date fillable DD Form 2285 down below in PDF-format or find it on the Department of Defense documentation website. terms and conditions contained herein, and as may be amended by competent authority. is valid only for IMS entering U.S. training under the Foreign Assistance Act of 1961, as amended, or the Arms Export Control Act. Security Assistance Training Regulation, JSATR (SECNAVINST 4950.4/AR 12-15/AFJI-105). FOR PURPOSE OF COMMENCING TRAINING LISTED IN ITEM 8 BELOW. (List in sequence of attendance) NO ADDITIONAL TRAINING TO THAT SPECIFIED IN THIS ORDER WILL BE PROVIDED. station cited in the appropriation and other activities as required by appropriate U.S. MILDEP regulations. a. IMS COMPLETED THE IN-COUNTRY DLI ENGLISH LANGUAGE PROFICIENCY EXAMINATION AS FOLLOWS. a. U.S. SECURITY/POLITICAL SCREENING HAS BEEN ACCOMPLISHED. ALL TRAINING WILL BE CONDUCTED ON AN UNCLASSIFIED BASIS. AN OFFICIAL DELEGATED AUTHORITY AND U.S. FOREIGN DISCLOSURE REGULATIONS OR DIRECTIVES. ACCOMPANY IMS OR JOIN IMS WHILE IN TRAINING, BUT WILL NOT BE TRANSPORTED NOR SUBSISTED AT U.S. GOVERNMENT EXPENSE. IMET IMS IS NOT AUTHORIZED AN INCREASE IN LIVING ALLOWANCE DUE TO PRESENCE OF DEPENDENTS. (a) NATO IMSs UNDER IMET: CHARGES FOR ONLY INPATIENT CARE IN THE U.S. ARE CHARGEABLE TO THE IMETP. APPROPRIATE MILDEP FOR PROCESSING WITH DEPARTMENT OF STATE, INL. (a) SEE ITEM 15, "SPECIAL CONDITIONS". (1) IMS IS AUTHORIZED TO PARTICIPATE IN HAZARDOUS DUTY TRAINING. (2) IMS IS PARACHUTE QUALIFIED AND AUTHORIZED TO PARTICIPATE IN JUMPS FROM U.S. AIRCRAFT. PARTICIPATE IN FLIGHTS IN HIS COUNTRY'S MILITARY AIRCRAFT AS (List flight crew position). (1) PARTICIPATING IN PHYSICAL FITNESS TRAINING IS REQUIRED. (1) UPON COMPLETION OF TRAINING, IMS IS NOT AUTHORIZED LEAVE, AND WILL PROCEED IMMEDIATELY AS DIRECTED TO HOME COUNTRY. DAYS LEAVE AT NO COST THE U.S. GOVERNMENT OR IMETP. UPON COMPLETION OF LEAVE, IMS WILL PROCEED IMMEDIATELY TO HOME COUNTRY OR AS DIRECTED BY COMPETENT AUTHORITY. (1) LIVING ALLOWANCE IS RESPONSIBILITY OF THE FOREIGN GOVERNMENT. CITE IN ITEM 9, THIS ORDER. AND IS CHARGEABLE TO THE FUND CITE INDICATED IN ITEM 9, THIS ORDER. CITE INDICATED IN ITEM 9, THIS ORDER. THE FUND CITE INDICATED IN ITEM 9, THIS ORDER. (6) SEE ITEM 15, "SPECIAL CONDITIONS". (1) TRAVEL IS RESPONSIBILITY OF THE FOREIGN GOVERNMENT. (2) TRAVEL COVERED BY THIS ORDER, OVERSEAS AND CONUS, IS CHARGEABLE TO THE FUND CITE INDICATED IN ITEM 9, THIS ORDER. IS THE RESPONSIBILITY OF THE FOREIGN GOVERNMENT. TO CONUS AND RETURN IS CHARGEABLE TO THE FUND CITE INDICATED IN ITEM 9, THIS ORDER.
. LAST TRAINING INSTALLATION WILL ARRANGE RETURN TRANSPORTATION TO HOME COUNTRY. IS NOT AUTHORIZED TO TRAVEL BY POV. (1) NO BAGGAGE WILL BE TRANSPORTED AT U.S. GOVERNMENT EXPENSE. paid from U.S. funds (See Para. g., above) and cost of authorized excess baggage is chargeable to the Fund Cite indicated in Item 9, this order. (2) TRAINING LESS THAN 22 WEEKS IN TOTAL DURATION: IMS AUTHORIZED 2 PIECES, NOT TO EXCEED 70 POUNDS (32 KILOGRAMS) EACH. (4) ALL TRAINING 40 WEEKS OR LONGER IN TOTAL DURATION: IMS AUTHORIZED 4 PIECES, NOT TO EXCEED 70 POUNDS (32 KILOGRAMS) EACH. TRAINING ARE AUTHORIZED ONE ADDITIONAL PIECE OF BAGGAGE. part of the course tuition. such action in accordance with U.S. MILDEP regulations. applicable pay and allowances by the IMS. resulting from the IMS's action. also possess adequate civilian clothing for off-duty wear.